← 1970’s UK Cadbury Monster Bar Wrappers – My Complete Series 1 and 2! 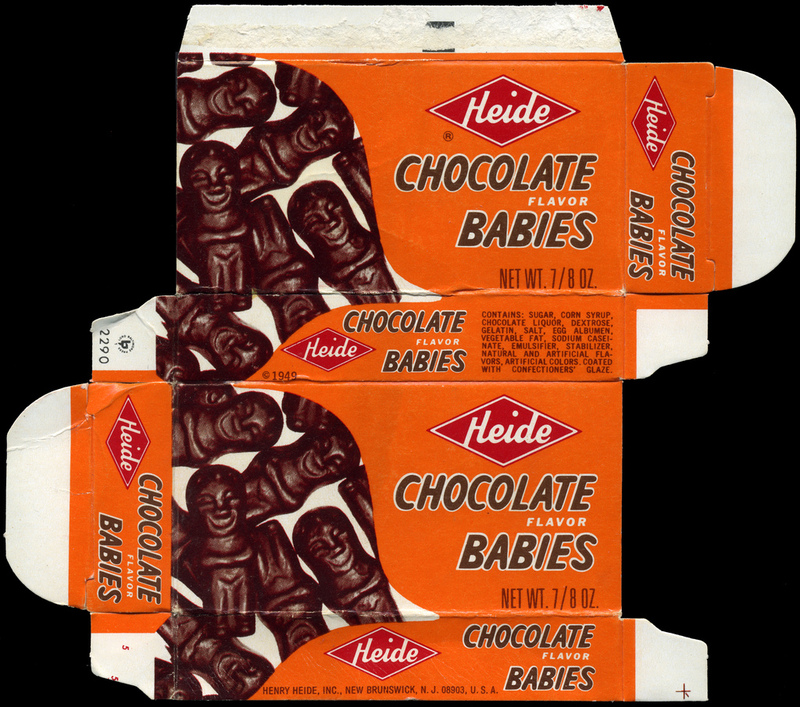 Heide’s Chocolate Babies – A Look Back at a Forgotten Favorite! 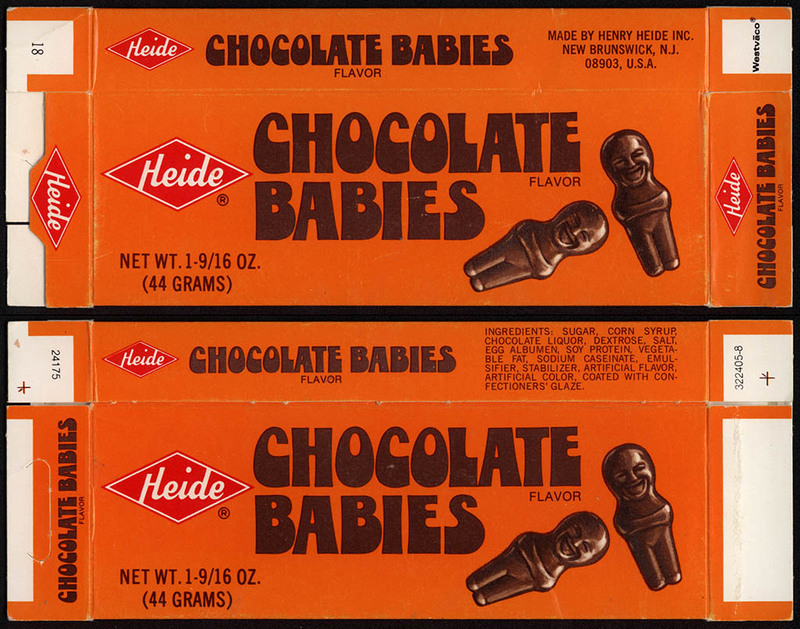 Today I’d like to look at an old-fashioned treat that’s not easy to find these days, but one that’s had some groovy packaging along the way: Heide’s Chocolate Babies. 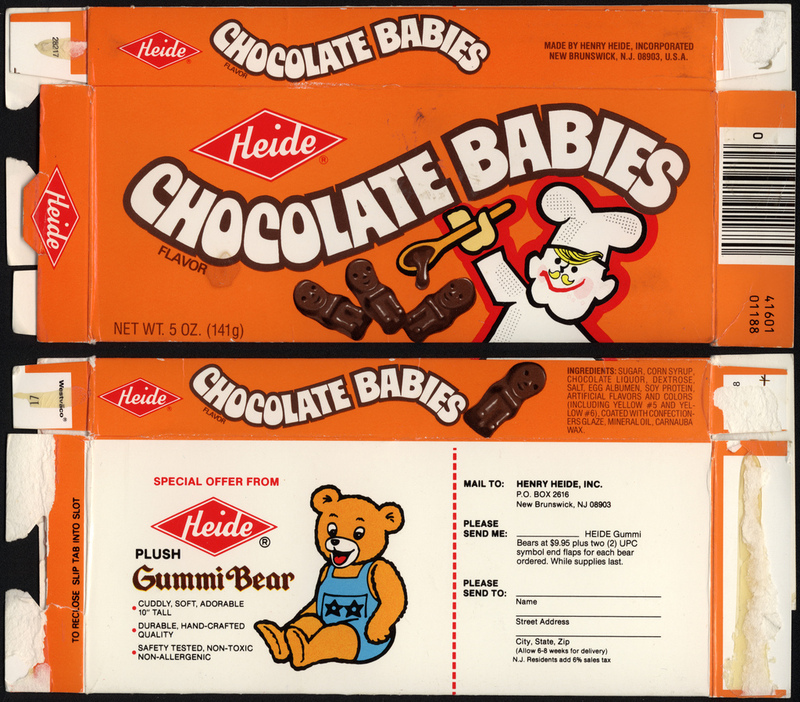 For those that are too young to remember Chocolate Babies, they were the consistency of candy corn, but with a chocolate flavor. They were molded roughly in the shape of swaddled infants, though to me that was always up for interpretation. My guess is that as the 1990’s arrived, Chocolate Babies had fallen out of favor with consumers, and individual boxed sales ended. Even so, today Chocolate Babies continue to be produced as a bulk item and are still available from a few online outlets (they’re currently produced by Necco). And that’s everything I’ve got on this look back at Heide’s Chocolate Babies. I hope you enjoyed it, and I’ll see you next time! This entry was posted in 1970's, 1980's, Chocolate, Novelty and tagged candy collecting, candy collection, candy collector, candy wrapper collection, candy wrapper collector, collectible, collecting candy, confectionery, confections, Heide candy, Necco, packaging, sweets, vintage candy wrapper, wrapper. Bookmark the permalink. 6 Responses to Heide’s Chocolate Babies – A Look Back at a Forgotten Favorite! I just found your posting here about “chocolate babies”. After reading your comments, I thought you’d enjoy this. Last night, at a favorite local auction, I acquired a 10″ high “Chocolate Baby”! Yes, and I think there were only a few of us who recognized what it was. I’m now sixty years old, and remember more than a few old favorites we just don’t see anymore. I hadn’t thought about chocolate babies until I was reminded last night. “Choco-baby” is most likely an old store display. He’s made of a hard beeswax, and must be very old. With a little sun fading on his front, he probably did front window duty. I believe the last time I had ‘Chocolate Babies’ was about fifteen years ago in Milford PA. My wife and I came across a vintage candy shop that had all kinds of gone-but-not-forgotten treats! As we continue to lose so much in this new millenial world, I’m always glad to hear that a company like Necco is willing to pick up the reins, and keep things like this around. I used to go to a mom and pop little corner store on my way walking home from elementary school every day. I bought a bix of chocolate babies. I liked to bite the heads off the babies. Finished them on my 4 block walk. That conjures a nice memory! It seems that today, too many people will overlook a small experience like that. As we’ve all grown up, we may find that those “little thing” are actually the big things in our lives. Update: So strange that I should get an email of your post this morning, as I was taking another look a “Choco-Baby” after a year and a half. I could find no more information, and all this time, it’s been sitting here in my studio. I just found out that ‘CB’ is actually a “Cewpie”! I was just listening to a children’s book called “All-of-a-Kind Family” by Sydney Taylor and they mentioned Chocolate Babies as a candy in the year 1912. I started looking around to find out what these candies even looked like and I’m glad that I found your post. I’m not sure if this is an inconsistency of the author remembering her childhood because although the Heide Candy Company was founded in 1869, the only mention of beginning candy production was listed in 1920 with Jujyfruits. Maud Hart Lovelace remembered having them on her first day of kindergarten which would have been in 1897 in the book “Betsy-Tacy.” I also wanted to look it up after reading about them in “All-of-a-Kind Family” as well! I too first heard of them when I read about Gertie and Charlotte sharing bits of “crackers “ and Chocolate Babies! In the 1970’s they were still for sale, so I could recreate the scene from the book. Haven’t seen any for years. As an adult, I wondered if there was possibility a “racist” concern with the candy. It’s a bit strange— a candy shaped like a baby. And biting off the heads seemed to be how most kids ate them. 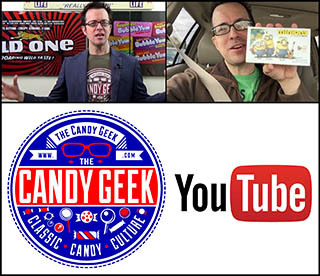 Love to learn the history behind this candy! Note: I enjoyed candy cigarettes too— and never smoked.